The building of this church started in the year 1892 and it was completed in the year 1896. 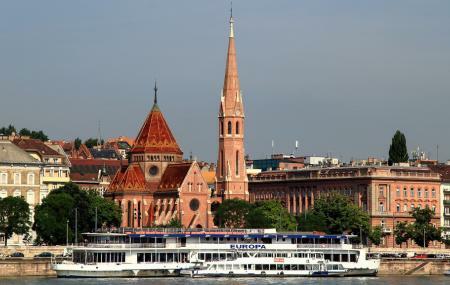 It is a very popular church of Budapest that follows the Calvinist theory of Christianity. Apart from this it is also famous for the accompanying tower that is 62 meters in height. The architecture of this church stands out because of the four sanctum like structures that surround it. Like many famous churches of the time, even this church was completely destroyed in World War II, but also like many other attractions in Budapest-it has a story of rising from the ashes. Today, it is a very popular church for the Protestants who follow Calvinist theory. Maintain tranquility within the church. Seek permission before taking any photograph. Mass timings may vary. Ask the church authorities about the details. How popular is Calvinist Church? People normally club together Imre Varga Collection and Inner-city Parish Church while planning their visit to Calvinist Church. People also prefer to start their day with Calvinist Church. The church is beautiful outside but i never step inside because always i came in time of religious services. Happened to pass by and spotted this cathedral with an interesting roof design.